Scarlet picks up right where Cinder ended, Cinder is currently in prison but Dr. Erland has just left her with new prosthetics and a lot of new information. Cinder has just been told that not only is she Lunar, but she is the missing Princess Selene of Lunar. Dr. Erland has given her two tasks; escape from the prison and then join him in Africa. In true Cinder fashion, she escapes from prison but she picks up another prisoner on her way, “Captain” Carswell Thorne. Together they manage to reach Thorne’s stolen spaceship and leave New Beijing. We also get introduced to a couple other new characters, Scarlet Benoit, who is looking for her grandmother, and Wolf, the mysterious street fighter that is helping Scarlet get her grandmother back. This book alternates between Cinder and Thorne’s escape, Scarlet and Wolf’s quest and Kai’s dealings with the ever persistent Queen Levana. Cinder is just as great as before but she really has trouble accepting her true identity. Once she escapes prison, she heads to France to find Michelle Benoit who may have the answers to Cinder’s past. Cinder is also equipped with a brand new cyborg hand which has cool new features like tranquilizer darts and she is not afraid to use them! I really liked the comedic Thorne, when he first meets Cinder he explains how he started a soap protest in prison because the soap was too drying for his skin! He brings a great sense of humor to the plot. Scarlet and Wolf were also great characters, Scarlet is very strong and a fighter. She will not let anything stop her from finding her grandmother. Wolf is very animalistic and mysterious but he also has a gentle side that he shows especially when he is with Scarlet. There were times when I wanted to hate him but I couldn’t. Just like in Cinder, this book follows a quick pace with lots of action. There are the elements of the traditional fairytale but Meyer still manages to add her own twist to them to make the story great. The only thing I did not like was the ending! Warning, there is a major cliffhanger that will leave you wanting the next book now! 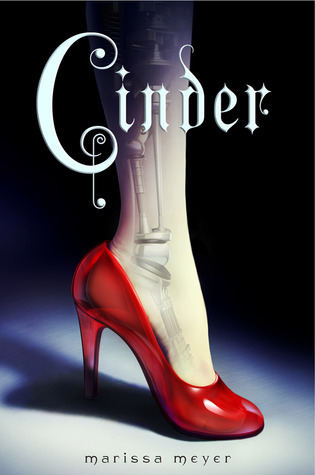 Cinder is a cyborg girl living in New Beijing with her stepmother and two stepsisters. When a deadly plague infects her sister, Cinder must work with the handsome Prince Kai to find a cure while unraveling her mysterious past. I normally don’t read fairytale retellings but this one caught my interest. The idea of a cyborg Cinderella is inventive and refreshing. Cinder is a mechanic who lives with her stepmother and two stepsisters. Cinder is under appreciated by her stepmother Adri in part because of her cyborg status. Adri is constantly reminding Cinder of her lower rights as a cyborg. But Cinder finds ways to fight back and rebel against Adri which just makes her an even better character in my opinion. Plus, she has a lot of great enhancements as a cyborg including a built in lie detector, a secret compartment in her leg, and the internet in her head. I really liked Prince Kai too, of course he was incredibly handsome which didn’t hurt, but he was also genuinly nice to Cinder. It will be interesting to see where their relationship it going to go. There never seemed to be a dull moment throughout the book. Between Adri’s eveil schemeing, the deahtly Plague, and the terrifying Lunar Queen Levana, Cinder is alwys trying to overcome some obstacle. Some parts of the story were predictable but I had expected that with a retelling of Cinderella. Even the predicable parts had a futuristic twist to them that was exciting. Cinder is a strong and likeable character and I enjoyed following her on her adventure. Overall I really enjoyed this book and I can’t wait for the next one!